Million Dollar Dip is the dip of many names: ABC Dip, Neiman Marcus Dip, Million Dollar Dip, One Million Dollar Dip. Well, you get the idea. What IS it? Million Dollar Dip is a handful of ingredients that meld together into one glorious taste explosion. 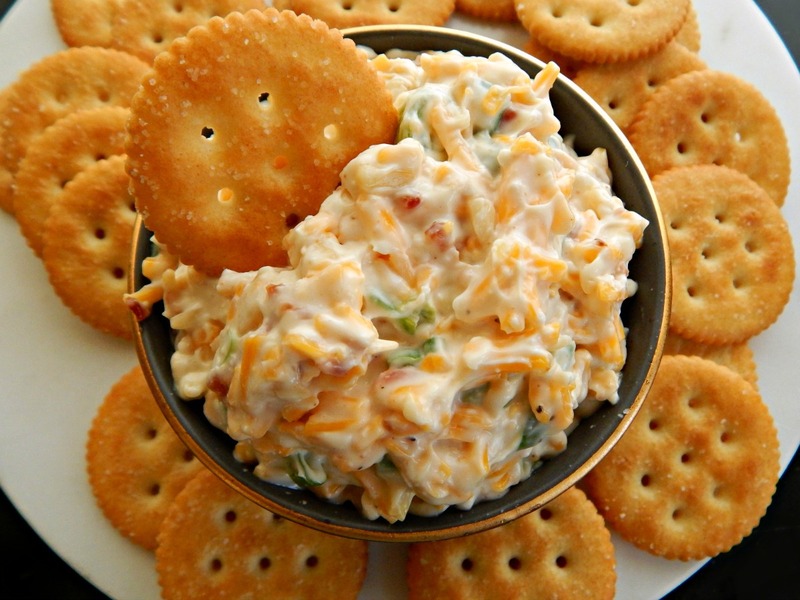 My Million Dollar dip has mayonnaise (and I always add a little cream cheese, just to improve the texture) green onions, just for a bit of freshness, Cheddar cheese, bacon, and almonds. The sometimes name of ABC Dip comes from Almond, Bacon & Cheddar. I don’t know if this dip was ever served at Neiman Marcus or where the name Million Dollar came from. I’m going to tell you it’s good enough to be served at Neiman Marcus, An awful lot of recipes are credited to Neiman Marcus, including Cowboy Caviar and the Famous $250.00 Chocolate Chip Cookie. If you haven’t heard that tale, I’ll send you over to Eater to get their view on that Cookie Story. I guess that’s the way the cookie crumbles. But back to the Million Dollar Dip. There is one caveat that’s important. While the Million Dollar Dip is perfectly good the first day, this is an ideal make-ahead recipe. The next day Million Dollar Dip really shines. Everything comes together in some kind of magical alchemy. So if you do have time to make the Million Dollar Dip ahead, go for it! Even though it’s not an original ingredient, I always add a touch of cream cheese to add just a little substance to the dip. Make sure to take your cream cheese out ahead so it’s nice and soft. If you forget, put it in the microwave for about 20 seconds. I like to cook up bacon for Million Dollar Dip – with so few ingredients, a good bacon is important. In a pinch, you could use bacon bits, the real ones, or the precooked bacon, but don’t even bother if you’re going to use those dry bits from the jar. Since this recipe calls for 8 strips of bacon it’s worthwhile pulling out a sheet tray and baking it. See my post on Buffet Style Hotel Bacon for instructions. Baking that bacon just makes everything so much easier. No fuss, no mess. No spatter. Any holiday week is likely to have great sales, and the Super Bowl is no exception – and if you’re into indulging in chips, crackers, and all the accompaniments that go right along with the biggest game day ever, it’s a great time to buy and stock up. Me, I’m getting back to my healthy eating plan…maybe after I make something sweet for Valentine’s day, lol! Mix cream cheese and mayo together. Add remaining ingredients. Cover and chill for 12 to 24 hours if time allows. Regrow Green Onions in a sunny window. I’ll be sharing this dish at Fiesta Friday, cohosted this week by Ai @ Ai Made It For You and Petra @ Food Eat Love. Stop over, visit their blogs – I know there are a lot of special dishes this week! This entry was posted in Click here for Fabulous Food Posts and tagged Appetizer, Bacon, cheddar, Cheese, Green Onion, Mayonnaise, Spreads and Dips. Bookmark the permalink. I’ve never tried this but it looks delish. How do you think this would be if I added jalapenos? For some spice….weird? Hi Deena, and sorry to reply late – I have been travelling! Hope it’s not too late for you but I think jalapenos (roasted, not raw) would be absolutely fantastic!! I would probably leave out the almonds if I added jalapeno. Thanks! It went over very well at our house. As does just about anything with bacon, lol! I like anything Cheddar – I could die happy with that!! It is rugby season and I have to make this! I will remember to make it the day before, how funny about the flavors! Thank you for bringing this to Fiesta Friday! 🙂 Have a lovely rest of the week! Ha ha! Do Americans not say moreish then? What is not to like when there is bacon! Hope you enjoyed the Super Bowl. Well, I missed a lot of it – but I’m not a huge football fan. Just like the food and the commercials, lol! Lady Gaga was kind of amazing…first time I’ve seen her. What resolutions? This looks amazing! Thanks! We really enjoyed it. Especially my Dad! Rhonda, you’re the best! And I’m still making that berry cake. It just won’t get off my mind!! That does look amazing. Is it bad that I’m waiting until after Valentine’s Day to start my New Years resolutions? I mean, that’s a thing, right?! Either way, I have a few more days for dip! lol! Whatcha making for Valentine’s? I’m gonna have to stop by and see!!! I’m playing around with the idea of raspberry filled cupcakes with white chocolate frosting. I think you have the white chocolate buttercream recipe – mind if I borrow it? 🙂 It has been haunting me ever since I saw it on your blog!! lol!! Trying to lose weight and fighting a bit of a losing or should I say unlosing battle!! We plant the ends of our green onions in the top of our upside down tomato planters each year. Fresh green onion all spring/summer/fall long! I’ve never thought to grow them indoors that way, thanks! p.s. dip looks super yummy! How cool!! I will remember that for next summer – if it ever comes!! I have been wanting to try those upside down planters on the deck! You like them? Wow, how exciting!! I can barely keep the houseplants alive these days…we’ll go with starter plants! I admire your energy, though! I have an absolute fear of slugs and worms…uggghhh. We don’t have too many slugs either in SD or in MN. Now that I’m an adult, I realize that I can eat dip for meals if I want. This may be a dinner for me soon. 😀 YOLO! You have no idea how much you just made me laugh because the other day I was downstairs playing with the dogs & went up at noon to make the folks dinner. They had fixed their own and my dad was very happily eating some leftover spaghetti and my stepmom had put a huge blob of this dip on her plate and was eating it with a fork. She said, “This is delicious!” I don’t know what she thought it was, lol, but I know she didn’t have any idea it was dip! Just plain water – you’ll want to change it out every couple of days. The green onions will grow well a couple of times but will eventually get weaker and will have to be replaced. Keep them in a sunny window..
thx..plus it keeps them fresh longer I’m sure!